Lifeskills through music by Lyn Thomas and Janet Stutley. Suitable for use with children in preschool/childcare settings and early primary school. 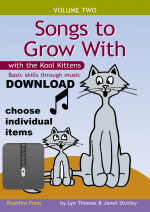 This specially designed resource aims to teach basic skills in a fun and engaging way through music. 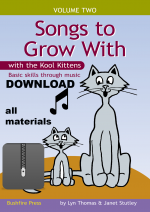 It includes 10 action-based songs, covering celebrations and special events, day and night, finger tricks and counting, fine motor skills, road safety, self-esteem, nutrition, the four seasons and more. We’re flexible- you can purchase the whole set at a discounted rate, or select individual tunes! This resource is available for immediate download after purchasing. Songlist: The Hello Song, Yum Yum Yum, My Kangaroo, Day and Night, Finger Tricks, I Can Try, Celebrations, Circle Song, Kit the Cat, and Seasons.